After AzhwAr had said “kAppAy nI kAppadhanai AvAy nI vaikundham IppAyum evvuyirkkum nI” [as in the previous pAsuram], emperumAn became very happy. Just as it is said “kim mrushtam suthavachanam” (Which is the sweetest to hear? It is hearing one’s child speaking) emperumAn, desirous of hearing more sweet words from AzhwAr, tells AzhwAr “AzhwIr! Your pAsurams are very sweet to hear. Compose one more pAsuram”. AzhwAr immediately composes another pAsuram (this) dipping the all pervading quality of emperumAn in his mellifluous words and offers to emperumAn. thavam dhEvar dhEvanum nIyE – you are the head of celestial entities such as brahmA et al who became celestial entities after carrying out penance. nIyE ulagellAm – many pramANams (authentic sources of information) have been given to substantiate that emperumAn is all pervading. Since no creation can exist if separated from him and since such a separated state cannot be seen, there is nothing wrong in saying that emperumAn is the world. ninnaruLE niRpanavum – the prurushArtham mOksham (liberation or SrIvaikuNtam), which is stable and permanent, happens due to your mercy. This can also be construed as – all creations exist in a stable way, due to your mercy. But since this meaning is conveyed by the previous verse nIyE ulagellAm periyavAchchAn piLLai, the vyAkyAthA (commentator) for this prabandham supported the meaning relating to purushArtham. Since the goal in paramapadham is unlimited, plural number niRpana has been used. nIyE thavaththEva dhEvanum – you are the lord of those who became deities after carrying out penance. svEthasvathara upanishath says “tham dhEvanAm paramancha dhaivatham” (emperumAn is the supreme deity for all those deities). mahAbhAratham sabA parvam 14-8 says “yugakOti sahasrANi vishNumArAdhya padhmabhU: I punas thrailOkyadhAthruthvam prApathavAnithi SuSruma: II ” (we hear that by carrying out penance towards vishNu for thousands of crores of yugas, brahmA attained the position of being the head of the three worlds once again). nArasimha purANam says “brahmAdhayas surAs sarvE vishNumAradhya thE purA I svam svam padhamanuprApthA: kESavasya prasAdhatha: II ” (dhEvas such as brahmA et al worshipped vishNu and with his mercy attained their respective position). mahAbhAratham says “mahAdhEvas sarvamEdhE mahAthmA huthvA’thmAnam dhEvadhEvO babhUva” (by sacrificing himself in the sarvamEdha yAgam (a ritual), the great soul mahAdhEva (rudhra) became a deity). Thus in all these cases, it is clearly established that emperumAn is the supreme deity for all those who became deities after carrying out penance towards him. nIyE erisudarum mAl varaiyum … – is it required to say these separately? 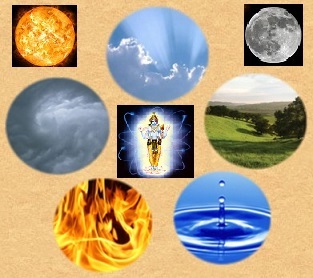 You are the burning fire, the huge mountains which sustain earth, the eight directions, sUrya and chandhra (sun and moon) which are within the universe. All these are under your control. This is in line with the SrI vishNu purANa SlOkam 2-12-38 “jyOthimshi vishNur bhuvanAni vishNur vanAni vishNur girayO dhiSaScha” (all the radiant objects are vishNu; all the worlds are vishNu; all the forests are vishNu; all the mountains and directions are vishNu). We will move on to the 21st pAsuram next. This entry was posted in iyaRpA, nAnmugan thiruvandhAdhi on July 6, 2018 by T N Krishnan.